Everyone loves a little surprise. And candy too! So, I put them together in this little Easter Egg Surprise freebie! 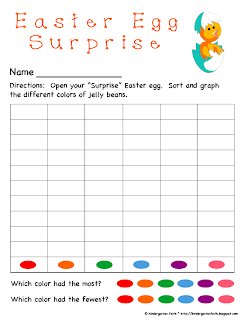 :o) It is a jellybean graphing activity, and the kids will love seeing what colors they have hidden in their egg. I filled those little plastic eggs full of Jolly Rancher jellybeans (that is my favorite kind), and then let the kids pick one egg out of the basket. After sorting, counting, and graphing......the fun part begins......eating the jellybeans! Yeah! Happy Easter. Click on the picture below to download this fun little freebie.